(CNN) -- Singer Rihanna, through her lawyer, asked a judge Thursday not to prohibit her boyfriend, singer Chris Brown, from having contact with her while he faces felony charges of assaulting her. 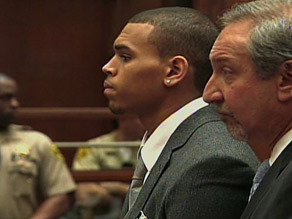 Chris Brown attends his arraignment in Los Angeles on Thursday. Attorney Mark Geragos is at right. The judge granted Rihanna's request. Brown, 19, allegedly attacked Rihanna, 21, during an argument in February that began when she found a text message from another woman on his cell phone, according to a sworn police statement. Brown appeared before a judge Thursday on the two felony counts, but his arraignment was delayed until next month at the request of his lawyer. Authorities charged Brown on Thursday with felony counts of assault and making criminal threats, the Los Angeles County, California, District Attorney's Office said. If he is convicted, the sentence could range from probation to four years and eight months in prison, the office said. Rihanna's lawyer, Donald Etra, stood near Brown and his lawyer, Mark Geragos, during the brief hearing. Rihanna was not in the courtroom. What's next for Brown? Will Rihanna testify? New details about the alleged attack on "Showbiz Tonight." Referring to the "no contact" order that could have been imposed, Etra told reporters after the hearing, "Rihanna requested that no such order be issued." Etra said the less stringent protective order against harassment and threats signed by Lousteau was "more than sufficient in this case." Etra did not respond when reporters asked if the singer was cooperating with prosecutors in the case against Brown. Brown, dressed in a suit and tie, said little during the hearing, except to answer "yes" when the judge asked him if he wished to waive his right to a speedy trial in exchange for a delay in arraignment. He then signed a waiver, which also allows Geragos to appear without him in court for hearings on routine issues. Lousteau ordered Brown to return to court on April 6 for formal arraignment. "Brown was driving a vehicle with Robyn F. as the front passenger on an unknown street in Los Angeles. Robyn F. picked up Brown's cellular phone and observed a three-page text message from a woman who Brown had a previous sexual relationship with. "A verbal argument ensued and Brown pulled the vehicle over on an unknown street, reached over Robyn F. with his right hand, opened the car door and attempted to force her out. Brown was unable to force Robyn F. out of the vehicle because she was wearing a seat belt. When he could not force her to exit, he took his right hand and shoved her head against he passenger window of the vehicle, causing an approximate one-inch raised circular contusion. "Brown looked at Robyn F. and stated, 'I'm going to beat the s--t out of you when we get home! You wait and see!' "
"Brown resumed punching Robyn F. and she interlocked her fingers behind her head and brought her elbows forward to protect her face. She then bent over at the waist, placing her elbows and face near her lap in [an] attempt to protect her face and head from the barrage of punches being levied upon her by Brown. "Brown continued to punch Robyn F. on her left arm and hand, causing her to suffer a contusion on her left triceps (sic) that was approximately two inches in diameter and numerous contusions on her left hand. "Robyn F. then attempted to send a text message to her other personal assistant, Melissa Ford. Brown snatched the cellular telephone out of her hand and threw it out of the window onto an unknown street. "Brown continued driving and Robyn F. observed his cellular telephone sitting in his lap. She picked up the cellular telephone with her left hand and before she could make a call he placed her in a head lock with his right hand and continued to drive the vehicle with his left hand. "Brown did not know what she did with the key and began punching her in the face and arms. He then placed her in a head lock positioning the front of her throat between his bicep and forearm. Brown began applying pressure to Robyn F.'s left and right carotid arteries, causing her to be unable to breathe and she began to lose consciousness. "She reached up with her left hand and began attempting to gouge his eyes in an attempt to free herself. Brown bit her left ring and middle fingers and then released her. While Brown continued to punch her, she turned around and placed her back against the passenger door. She brought her knees to her chest, placed her feet against Brown's body and began pushing him away. Brown continued to punch her on the legs and feet, causing several contusions. "Robyn F. began screaming for help and Brown exited the vehicle and walked away. A resident in the neighborhood heard Robyn F.'s plea for help and called 911, causing a police response. An investigation was conducted and Robyn F. was issued a Domestic Violence Emergency Protective Order." At the end of his statement, Andrews said Brown sent a text message nine days later apologizing. "In the text message, Brown apologized for what he had done to Robyn F. and advised [Rihanna's assistant] Ford that he was going to get help." Brown issued a public apology for the incident last month.